Patients who received care from general practitioners for neck pain were randomly allocated to receive manual therapy (spinal mobilization), physiotherapy (mainly exercise) or general practitioner care (counseling, education and drugs). Throughout this 52–week study, patients rated their perceived recovery, intensity of pain and functional disability. 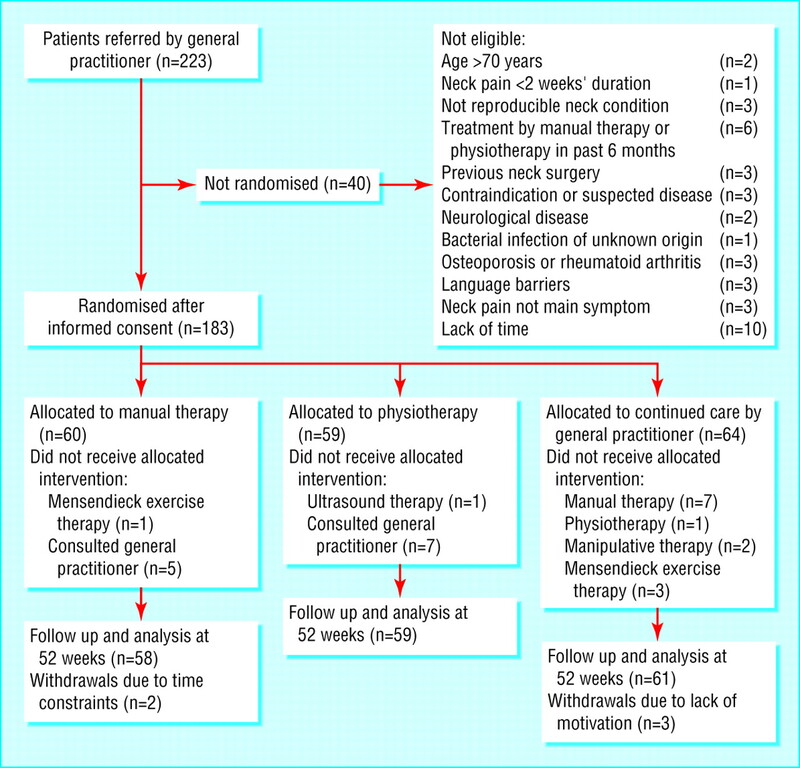 Manual therapy proved to be the most effective treatment for neck pain. The clinical outcome measures showed that manual therapy resulted in faster recovery than physiotherapy and general practitioner care. While achieving this superior outcome, the total costs of the manual therapy-treated patients were about one third of the costs of physiotherapy or general practitioner care. Neck problems account for considerable pain and stiffness that can lead to work absenteeism, disability and use of health care resources. Various conservative interventions have been proposed for treating neck pain, but few scientific evaluations have included any analysis of their cost-effectiveness. This randomized, controlled trial compared the efficacy of manual therapy, physiotherapy and general practitioner care in reducing neck pain. One hundred eighty-three patients with neck pain of at least two weeks' duration were randomly assigned to one of three groups: manual therapy (spinal mobilization); physiotherapy (mainly exercise); or general practitioner care (counseling, education and analgesics). Manual therapy consisted of a range of interventions: muscular mobilization, specific articular mobilization, coordination or stabilization. Spinal mobilization was defined as low-velocity, passive movements within or at the limit of joint range of motion. Outcome measures included perceived recovery, intensity of pain, functional disability and quality of life; direct and indirect costs were measured to determine mean costs between groups, overall cost-effectiveness, and cost-utility ratios. Patients completed cost diaries for one year, providing data on direct health care costs of practitioner care; additional visits to other health care providers; drugs; professional home care; and hospitalization. Direct non-health care costs included out-of-pocket expenses; paid and unpaid help; and travel expenses. Indirect costs (lost of production attributable to work absenteeism or days of inactivity for those with or without a job) also were evaluated. OBJECTIVE: To evaluate the cost effectiveness of physiotherapy, manual therapy, and care by a general practitioner for patients with neck pain. DESIGN: Economic evaluation alongside a randomised controlled trial. PARTICIPANTS: 183 patients with neck pain for at least two weeks recruited by 42 general practitioners and randomly allocated to manual therapy (n=60, spinal mobilisation), physiotherapy (n=59, mainly exercise), or general practitioner care (n=64, counselling, education, and drugs). MAIN OUTCOME MEASURES: Clinical outcomes were perceived recovery, intensity of pain, functional disability, and quality of life. Direct and indirect costs were measured by means of cost diaries that were kept by patients for one year. Differences in mean costs between groups, cost effectiveness, and cost utility ratios were evaluated by applying non-parametric bootstrapping techniques. RESULTS: The manual therapy group showed a faster improvement than the physiotherapy group and the general practitioner care group up to 26 weeks, but differences were negligible by follow up at 52 weeks. The total costs of manual therapy (447 euro; 273 pounds sterling; 402 dollars) were around one third of the costs of physiotherapy (1297 euro) and general practitioner care (1379 euro). These differences were significant: P<0.01 for manual therapy versus physiotherapy and manual therapy versus general practitioner care and P=0.55 for general practitioner care versus physiotherapy. The cost effectiveness ratios and the cost utility ratios showed that manual therapy was less costly and more effective than physiotherapy or general practitioner care. CONCLUSIONS: Manual therapy (spinal mobilisation) is more effective and less costly for treating neck pain than physiotherapy or care by a general practitioner. Neck pain is a common condition, affecting around a sixth of men and a quarter of women in the Netherlands. Neck problems are not life threatening, but they do cause pain and stiffness, often resulting in utilisation of healthcare resources, absenteeism from work, and disability. 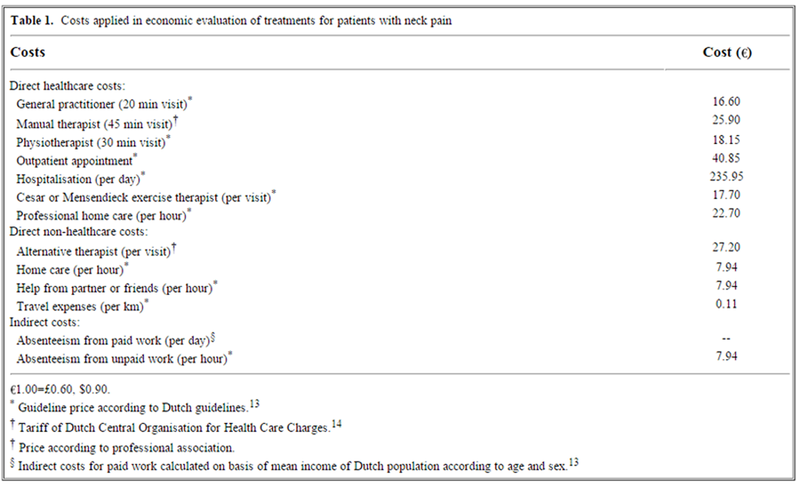 The total costs of neck pain in the Netherlands are estimated at $686m a year (£437m and 540m, according to 1996 costs). Therefore there is a need to determine the most cost effective intervention for neck pain. Forty two general practitioners recruited patients in 1997 and 1998. The general practitioners were randomly selected from a representative group of general practitioners. Inclusion criteria were neck pain for at least two weeks (confirmed during a physical examination at baseline), age 18–70, and willingness to comply with treatment and follow up measurements. Exclusion criteria were physiotherapy or manual therapy for neck pain in the previous six months, surgery of the neck, or a specific cause for the neck pain (for example, malignancy, fracture, inflammation). Eligible patients were enrolled who gave their written informed consent after physical examination and baseline assessment. Our sample size was based on the ability to detect a clinically important difference of 25% in perceived recovery between groups. We estimated that 60 patients in each group would give a power of 80% and an of 5%. A blinded administrative assistant allocated patients to one of the three intervention groups using a computer generated random sequence table. Allocation, concealed in opaque sealed envelopes, was on the basis of block randomisation (block size 6), after prestratification for severity of symptoms (0–6 points low severity, 7–10 points high severity), age (<40 years, 40 years) and, for practical reasons, the research centre (4). Within the boundaries of the protocol, each method of treatment could be adapted to the patient's condition. Patients were allowed to perform home exercises and to continue with the drug they were taking at baseline or to take over the counter drugs during the intervention period of six weeks. Patient education was included in each intervention. Manual therapy consisted of a range of interventions, including hands-on techniques (muscular mobilisation, specific articular mobilisation, coordination or stabilisation). Spinal mobilisation was defined as low velocity passive movements within or at the limit of joint range of motion. Spinal manipulation (low amplitude, high velocity techniques) was not provided. Chiropractors, osteopaths, and physiotherapists use mobilisation and manipulation techniques. In our trial, manual therapy was applied by six registered manual therapists who had followed a 3 year curriculum in manual therapy after training in physiotherapy. Treatment sessions lasting 45 minutes were scheduled once a week, with a maximum of six sessions. Physiotherapy was applied by five physiotherapists and consisted of individualised exercise therapy, including active and postural or relaxation exercises, stretching, and functional exercises. Additional massage and manual traction were optional, but specific manual mobilisation techniques (as applied in the manual therapy group) were discouraged. Treatment sessions lasting 30 minutes were scheduled twice a week, with a maximum of 12 sessions. General practitioner care (42 general practitioners) consisted of standardised care provided by a general practitioner. Follow up visits for 10 minutes, once a fortnight, were optional. Advice consisted of discussing the prognosis and factors that aggravated the condition, self care (heat application, home exercises), and ergonomic considerations. The patients were also encouraged to await spontaneous recovery. In addition, patients were given an educational booklet. If necessary, drugs such as paracetamol or non-steroidal anti-inflammatory drugs were prescribed on a time contingent basis. Clinical outcomes were perceived recovery, intensity of pain, functional disability, and utility. Patients rated their perceived recovery on a six point scale ranging from "much worse" to "completely recovered" compared with baseline. This scale was used to estimate the percentage of patients with a successful outcome, which was defined as "much improved" or "completely recovered." Mean pain during the preceding week was indicated by the patient on an 11 point scale. Functional status was measured according to the neck disability index, a scale comprising 10 items for activities of daily life, with a 5 point score. [8–10] Utility was measured with the EuroQol. Effects of the primary outcome measures were expressed as differences within each intervention group between baseline and 52 weeks. Perceived recovery was rated as the percentage of patients with a successful outcome. Manual therapy was the most effective treatment. Recovery rates after seven weeks in the manual therapy group, physiotherapy group, and general practitioner care group were 68%, 51%, and 36%, respectively. The number needed to treat was 3, that is, every third patient referred to manual therapy would make a complete recovery within seven weeks compared with patients referred to continued care by a general practitioner. This percentage remained stable in the manual therapy group during the follow up period, whereas both the physiotherapy group and general practitioner care group showed a slight increase in recovery rate over 52 weeks. Differences in recovery rates between groups were still statistically significant after 26 weeks but not at 52 weeks (See Table 3). Differences in pain intensity were small but statistically significant between the manual therapy group and the physiotherapy group at 52 weeks. The differences in disability scores at long term follow up remained small and were not statistically significant. Minor benign short term adverse reactions such as headache, pain and tingling in the upper extremities, and dizziness were reported more often for manual therapy and physiotherapy than for general practitioner care. Eleven patients (18%) who received manual therapy reported an increase in neck pain shortly after treatment. Table 4 shows the utilisation of healthcare resources by the groups. The number of manual therapy and physiotherapy treatments was substantial in the general practitioner care group, and most of these sessions took place after the intervention period. During the follow up period of 52 weeks relatively more patients (41/64; 64%) in the general practitioner care group took prescription drugs than patients in the manual therapy group (22/60; 37%) or physiotherapy group (23/59; 39%). Overall, 37% of the patients in the manual therapy group took over the counter drugs compared with almost 50% of patients in both the physiotherapy group and the general practitioner care group. Only nine patients reported the utilisation of other healthcare resources, such as radiography and professional home care (n=2). During the trial, only two patients were hospitalised for neck painone for additional neurological testing (physiotherapy group) and one for hernia of a cervical disc (general practitioner care group)whereas six visited a chiropractor. Only nine patients in the manual therapy group reported absenteeism from paid work owing to neck pain compared with 12 patients in the physiotherapy group and 15 patients in the general practitioner care group. Absenteeism from unpaid work was reported by 11 patients in the manual therapy group, 18 patients in the physiotherapy group, and 15 patients in the general practitioner care group. Table 5 shows the mean (standard deviation) costs for each intervention. Direct healthcare costs in the manual therapy and physiotherapy groups consisted mainly of the costs of the intervention treatment. The general practitioner care group showed an increase in utilisation of manual therapy, physiotherapy, and drugs after the intervention period. The total costs in the manual therapy group were around one third of the costs in the physiotherapy and general practitioner care groups. 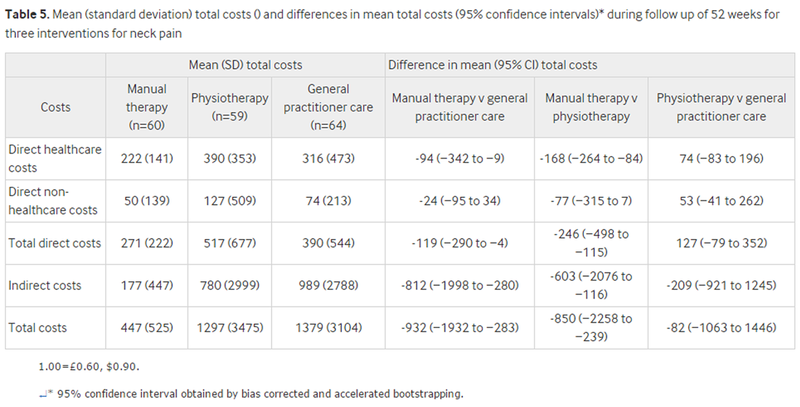 Total direct, indirect, and total costs were statistically significantly lower in the manual therapy group than in the physiotherapy and general practitioner care groups (See Table 5). Table 6 presents the cost effectiveness and cost utility ratios of all three comparisons. Figure 2 shows the cost effectiveness plane for pain intensity when comparing manual therapy and physiotherapy groups. The graph represents 5000 bootstrap replications of the cost effectiveness ratio for pain intensity comparing manual therapy with physiotherapy. 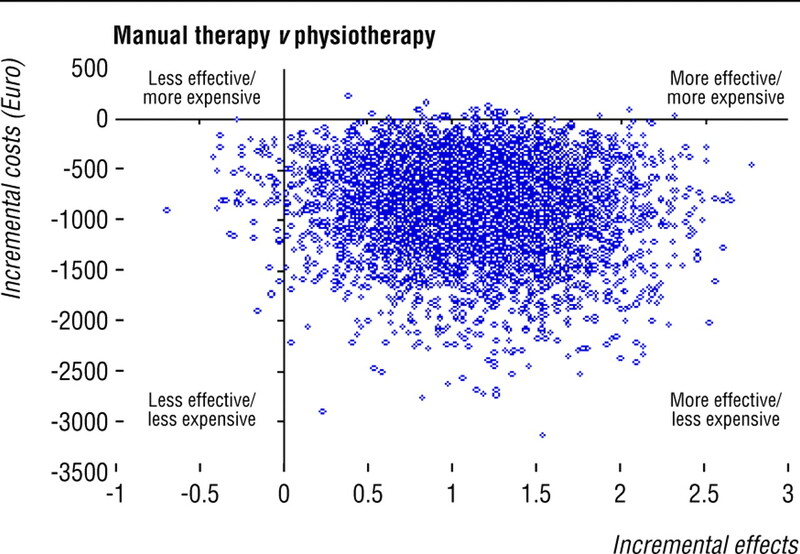 Most cost-effect pairs (98%) are located in the bottom right quadrant suggesting that manual therapy is dominant over physiotherapythat is, manual therapy is associated with a larger improvement in pain and lower costs. The cost effectiveness planes showed similar dominance of manual therapy over physiotherapy on recovery and quality of life (with most bootstrapped ratios in the bottom right quadrant, 85% and 87%, respectively). Also, a similar dominance was shown for the cost effectiveness planes for manual therapy over general practitioner care on perceived recovery and quality of life (96% and 97%, respectively, of bootstrapped ratios in the bottom right quadrant; Figure 3). The cost effectiveness planes for pain intensity and functional disability showed similar percentages of ratios in the bottom two quadrants, which confirms that there was no difference in these outcome measures between manual therapy and general practitioner care but lower costs for manual therapy. We found no statistically significant differences in costs and effects between physiotherapy and general practitioner care, and the cost effectiveness planes for this comparison confirmed this finding. The acceptability curve for pain intensity comparing manual therapy with physiotherapy showed that at a ceiling ratio of zero there was still a 98% probability that manual therapy was cost effective. Only two patients (physiotherapy and general practitioner care groups) were admitted to hospital. These patients were excluded in a sensitivity analysis (data not shown). 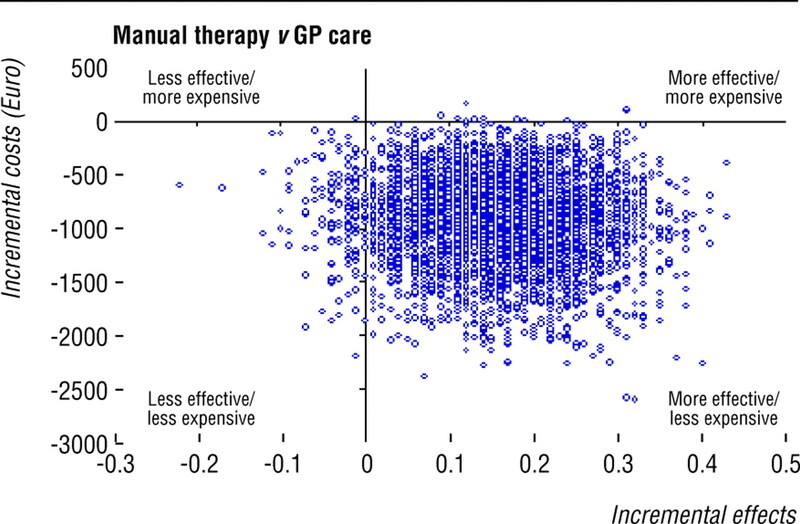 In this analysis the mean costs in both therapy groups decreased, but this had no impact on the statistical significance of differences between groups. The direct healthcare costs were, as expected, highest during the intervention period. The number of patients in the general practitioner care group who visited a manual therapist was high. A recent study showed that general practitioners in the Netherlands refer most patients with neck pain to physiotherapists instead of manual therapists. A possible explanation for the high referral rate to manual therapy may be that patients and general practitioners who participated in this study were better informed about the possibility of manual therapy as an alternative to physiotherapy. None of the randomised trials evaluating conservative treatment for neck pain published so far included an economic evaluation. One study, comparing chiropractic and physiotherapy for patients with low back pain and neck pain, included a cost measurement but did not conduct a full economic evaluation. Our economic evaluation alongside a pragmatic randomised controlled trial showed manual therapy to be more cost effective than physiotherapy and continued care provided by a general practitioner in the treatment of non-specific neck pain. Picavet HS, van Gils HW, Schouten JS. Klachten van het bewegingsapparaat in de Nederlandse bevolking: prevalenties, consequenties en risicogroepen. Borghouts JA, Koes BW, Vondeling H, Bouter LM. Cost-of-illness of neck pain in the Netherlands in 1996. Neck pain in general practice; prognosis, management and costs. Gross AR, Aker PD, Goldsmith CH, Peloso P.
Conservative management of mechanical neck disorders. A systematic overview and meta-analysis. Online J Curr Clin Trials Document No 200-1, 1996. Skargren EI, Carlsson PG, Oberg BE. One-year follow-up comparison of the cost and effectiveness of chiropractic and physiotherapy as primary management for back pain. Hoving JL, Koes BW, De Vet HC, Assendelft WJ, Van der Windt DA, Van Mameren H, et al. Manual therapy, physical therapy or continued care by the general practitioner for patients with neck pain: short-term results from a pragmatic randomized trial. Ann Intern Med 2002; 136: 713-722[ISI]. Hains F, Waalen J, Mior S.
Psychometric properties of the neck disability index. J Manipulative Physiol Ther 1998; 21: 75-80[ISI]. Stratford PW, Riddle DL, Binkley JM, Spadoni G, Wetsaway MD, Padfield B. Using the neck disability index to make decisions concerning individual patients. Physiother Can 1999; 51: 107-112. The neck disability index: a study of reliability and validity. J Manipulative Physiol Ther 1991; 14: 409-415[ISI]. Modelling valuations for EuroQol health states. Med Care 1997; 35: 1095-1108[ISI]. Goossens ME, Rutten-van Mölken MP, Vlaeyen JW, van der Linden SM. The cost diary: a method to measure direct and indirect costs in cost-effectiveness research. J Clin Epidemiol 2000; 53: 688-695[ISI]. Oostenbrink JB, Koopmanschap MA, Rutten FF. Handleiding voor kostenonderzoek, methoden en richtlijnprijzen voor economische evaluaties in de gezondheidszorg. Dutch Central Organisation for Health Care Charges. Tarieven voor medisch specialist, exclusief psychiaters. Bijlage bij tariefbeschikking nummer 5600-1900-97. A practical guide for calculating indirect costs of disease. New York: Chapman and Hall, 1993. Estimating confidence intervals for cost-effectiveness ratios: an example from a randomised trial. Stat Med 1996; 15: 1447-1458[ISI]. Van Hout BA, Al MJ, Gordon GS, Rutten FF. Cost, effects and c/e ratios alongside a clinical trial. Health Econ 1994; 3: 309-319[ISI]. Net health benefits: a new framework for the analysis of uncertainty in cost-effectiveness analysis. Med Decis Making 1998; 18 suppl: 68-80S. Acute and subacute neck pain: nonsurgical treatment. In: Nachemson AL, Jonsson E, eds. Neck and back pain: the scientific evidence of causes, diagnosis and treatment. Philadelphia: Lippincott, Williams and Wilkins, 2000:327-338. Van Tulder MW, Goossens ME, Hoving JL. Nonsurgical treatment of chronic neck pain.